Okay, okay, it's official. 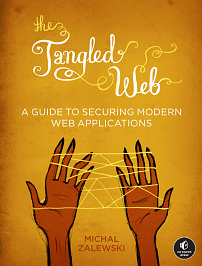 You can now buy The Tangled Web from Amazon, Barnes & Noble, and all the other usual retailers for around $30. You can also order directly from the publisher, in which case, discount code 939758568 gets you 30% off. No Starch provides a complimentary, DRM-free PDF, Mobi, and ePub bundle with every paper copy; you can also buy e-book edition separately. Kindle and other third-party formats should be available very soon. More info about the book itself, including a sample chapter, can be found on this page. Are there yet any plans for translation to other languages? It's up to individual publishers to buy the rights, translate, and publish it in other countries. Amazon is quoting December the 12th for availability here in the UK. The sample chapter was superb (not sure I ever thought I’d be applying that superlative to a chapter on HTTP). I love the characterisation of some of the more esoteric HTTP request methods as “thought experiments”. FWIW, if you're in the UK, you can order a print copy from No Starch at 40% off, with shipping around ~$10. Probably comparable in price, and you get a free PDF right away.